The Great Commanders Volume 1 DVD is the acclaimed six-part documentary produced by Britain's Channel 4 that is one of the most compelling documentaries of the world's great commanders. 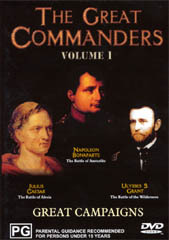 The first DVD of the collection contains three of the world's most brilliant military commanders that include Julius Caesar, Napoleon Bonaparte and Ulysses S. Grant whose tactics are still studied across universities world wide. Julius Caesar was not only a military genius but was also the ruler of Rome until his assassination in 44 B.C. Julius Caesar was loved by the people of Rome and his battle at Alesia is the focus of this documentary that led him to become a military genius. The second episode revolves around Bonaparte and explores his life from youth to great commander and his tactics at the battle of Austerlitz. The documentary recreates key scenes in his history through professional actors and some beautiful 3D graphics to help dissect his battle techniques. The last documentary of this DVD involves Ulysses S. Grant who became one of the greatest commanders in America during the Civil War. It also explains the history behind the man and how he managed to conquer the confederates through a severely weakened army. The video quality of DVD is perfect and features no flaws or errors whatsoever. Although not as clear as many current DVD's, the video quality is perfectly acceptable as this was originally made for television. The sound quality of the disc features Dolby Digital and the producers have gone to extreme lengths to make use of this feature, especially at the re-enactments of the battles on this DVD. The Great Commanders Volume 1 is a brilliant documentary series that students, teachers and history buffs will appreciate worldwide because of the accuracy and effort that has gone into the creation of this DVD. Recommended!